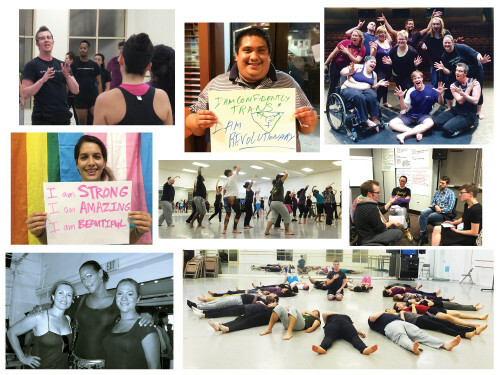 TRANSform Dance is our national advocacy and education program that provides resources, education and leadership development in order to identify and remove systemic barriers, increase trans/gender-nonconforming participation and leadership, and advance trans equity in Dance. TRANSform Dance responds to the continued crisis of the exclusion of trans and gender-nonconforming bodies, voices and leadership in Dance. TRANSform Dance works to transform trans people’s access, experience and leadership (or lack thereof) in Dance and to transform the national field in order to advance trans equity. TRANSform Dance’s activities are offered during short visits or residencies with dance venues, schools, service organizations, presenters, conferences and convenings, dance companies and other nonprofit arts organizations. Please contact General Manager Shawna Virago for more information or requests: freshmeatinfo@gmail.com. Trans-101 and Trans-201 Cultural Competency / Cultural Humility Trainings for dance venues, conferences, service organizations, studios, companies, conservatories, schools and nonprofits. TRANSform Dance is directed by Sean Dorsey. Dorsey is an award-winning transgender choreographer, dancer, advocate and longtime community activist; he has been making and touring work, supporting and presenting trans/gender-nonconforming artists, and championing trans artistic leadership for 20 years.